The study, published today in Science Advances, may be of particular interest to the 1.5 million people living within the bounds of the volcanic complex. Fortunately for them, there’s no indication that this massive event will happen any time soon. Volcanic eruptions like this can take thousands of years to develop, and there’s no way for volcanologists to tell when, or even if, this particular type of eruption will occur. Still, it’s a fascinating and rare look at the innards of one of the most dramatic phenomena on Earth. In the study, researchers found that molten rock (magma) under the Campi Flegrei volcano could be slowly building up toward a massive eruption, one big enough to carve out a huge depression on the landscape called a caldera. Since 1912, only seven caldera-collapsing events have occurred worldwide. Campi Flegrei has had at least two huge caldera-forming eruptions in its history, including one 39,000 years ago that sent nearly 48 cubic miles of magma roiling onto the surface, and another one 15,000 years ago that released 9.6 cubic miles of magma. The latter formed the current caldera at Campi Flegrei, which is more than eight miles across. Today the caldera is home to a regional park, towns, suburbs of Naples, and a cratered surface that occasionally trembles with earthquakes and sends belches of sulfurous gas into the air. For this study, researchers examined rocks from these caldera-forming eruptions — and 21 smaller eruptions from the same volcano — to pinpoint how the reservoirs of magma underneath Campi Flegrei changed over time. 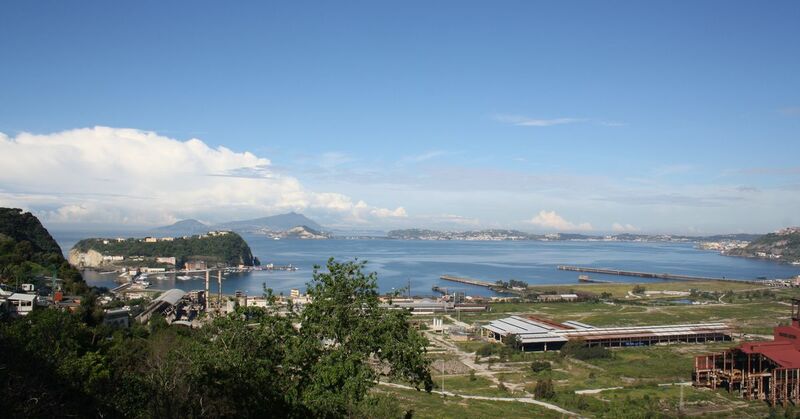 “Campi Flegrei is very special,” lead author and volcanologist Francesca Forni says. Forni started looking into the caldera-forming cycles at Campi Flegrei as a PhD student at ETH Zürich. To geologists, these two caldera-forming events happened relatively recently, in the past 60,000 years. That “young” age means that the rocks Forni was looking at were still relatively fresh, and hadn’t gone through damaging cycles of deformation and erosion, which might have destroyed valuable data. As it was, Campi Flegrei offered an extraordinary opportunity to look at the relatively new idea of cycles of caldera formation. “In the past, many studies at Campi Flegrei were focused on single eruption or limited period of activity. This is the first study that takes into account the magmatic evolution of the system” Forni says. The last time that the Campi Flegrei volcano had a significant eruption was in 1538 when an eruption built up a 403-foot-tall hill in a single week. The hill became known as Monte Nuovo, or “new mountain.” Forni’s research indicates that the conditions at that eruption were similar to those that preceded the caldera-forming eruption. “Generally, magmas want to erupt. They don’t like to accumulate in the crust.” Forni says. So conditions like temperature, pressure, gas content, and the presence of water all have to be just right for enough magma to build up and eventually form a caldera. Forni thinks that those conditions may have been met after the 1538 eruption, meaning the volcano could have kicked off another caldera cycle at that time. But time is a tricky thing when you’re dealing with cycles that endure far longer than any human lifespan. “We don’t have any constraints at the moment about time,” Forni says. “We don’t know when it will erupt in the future.” They know that the previous caldera cycle took 21,000 years, but there are no guarantees that the next one will take the same amount of time. There’s also a possibility that the volcano could simply go extinct before it creates another caldera. Without more data, there’s currently no way to tell. “Volcanos are not clocks, either in terms of time, or behavior,” Forni says. That doesn’t mean that people shouldn’t do their best to prepare for the potential hazard of a caldera-forming eruption. “These really big eruptions are extremely low probability,” Krippner says. “But if it does happen, we need to know as much as we can.” This study adds to that growing body of knowledge about Campi Flegrei. Krippner and Forni both emphasize that Campi Flegrei’s activity is extremely closely monitored by local authorities. They also point out that emergency planners are constantly on the lookout for much smaller signs of eruptive activity at the volcano. Preparing for future eruptions, whether they are caldera-forming colossuses or something far smaller, is a fact of life for the people who live in the area.